If you love everything technology, you are going to go crazy over the TAP Wearable Keyboard. Not only does it take gaming to a whole other level, but it’s perfect for anyone who wants their Bluetooth capable electronics to have a little more options and user ability. And did I mention that the TAP Wearable Keyboard is just really, really cool? It’s one of those “gadgets” that look awesome, PLUS bring great value to you as well. As a mom, it’s important to stay in the “know” about all these amazing gadgets that are out on the market. With Christmas on the horizon, I know a couple teen boys and girls would go CRAZY over having this wrapped and under the tree! TAP Wearable Keyboard – What EXACTLY is it? 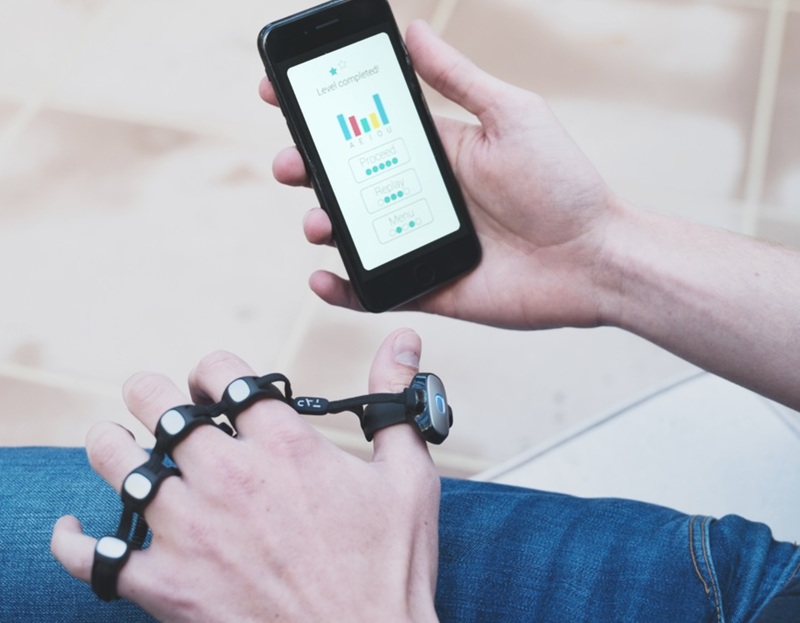 How does one even wear the TAP Wearable Keyboard? Valid question. It’s not cumbersome at all and actually fits on your fingers being held on by a strap. Your hands are entirely free to move around and tap, swipe, point, etc. on anything that you want to. No remote to have to worry about…nothing. In the thump portion of the TAP Wearable Keyboard, there is an ultra-compact laser optic mouse that can be used perfectly with any type of computer or laptop that has mouse capability. Talk about a fun and inventive way to add a little bit of excitement to your work day! When my kids saw it, they were instantly intrigued. Being able to control their game with their hands was amazing to them, plus, they even used it to do a bit of their online homework! How easy is it to use the TAP Wearable Keyboard? If you ask my kids, super simple. If you ask me, a little more difficult. However, I can say that there are some great apps out there that teach you rather quickly how to get the hang of using it. And just like anything else, practice makes perfect. When you first try out the keyboard, there’s going to be a bit of a learning curve, but after trying and using it several times, you’ll be TAPping away with the best of them! Have more questions about the TAP Wearable Keyboard? Just visit their website where you’ll find a ton more great information! Check it out HERE. If you love what you’ve read and are ready to make the purchase, welcome to the new world of virtual reality! For the low price of $170, the TAP Wearable Keyboard can be all yours! Keep in mind that it comes in two sizes only, small and large. 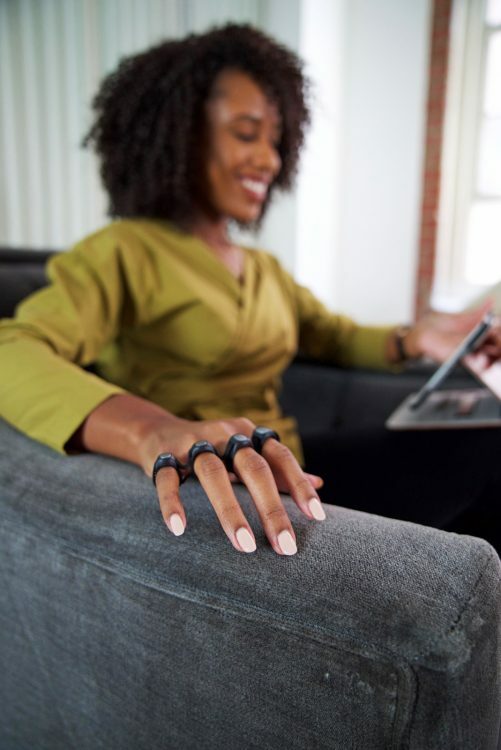 You can purchase the TAP wearable keyboard directly through the company on their website. But wait…you didn’t think we would tell you all about this amazing keyboard without giving someone the chance to win one, did you?! One lucky winner will be chosen to win a TAP Wearable Keyboard! Anyone who enters must be US 18+ years of age. The giveaway is open from now until November 5th, 2018 at 11:59 PM EST. WInner will be notified via email within 48 hours! Previous ArticleWhat Is Wrong With My Baby? Next Article Foam Letters Bath Toy – Bathtime has never been so fun! I’ve been looking forward to the release since I first heard of the idea. I just love new tech gadgets and this is revolutionary!! My youngest son is a total computer junkie. This would totally make his holiday. Wow this would be awesome. I would love to get one for my husband. Im curious as to the accuracy of tap wearable keyboards. Id think theyd be comfortable but wonder about the tech aspect. Sounds absolutely fantastic. Can’t wait to try this. Wow, seems pretty cool! My daughter would enjoy this. Awesome! I want one I sometimes have trouble with shoulder pain from typing on a keyboard too long. This could help. I was definitely intrigued by the title of this post, but I’ve got to admit I was thinking it was be a keyboard Halloween costume or something 😂 but this is much more interesting. I’d like to look into getting a tablet of some kind, so this seems like it’d come in handy! Wow, now that is some sweet technology! The wave of the future for sure! My kids saw this and were so excited! They want it for Christmas! My sons want it for gaming and my daughter wants it for typing reports. I did not know how to do an outline for a research paper until I found this topic on your site. I’m shocked by these technologies. What else will come up soon? It seems to me that soon we will be able to manage the gadgets using the power of thought. I would like to try these out. I am guessing these will be on our son’s wishlist. Wow! My techie son would love this. But he might have to pry it off of my hand. I love this wearable keyboard I would like to say that it would go to mt great nephew….. BUT … I would have to try it out and if I really liked it I would end of keeping it. I’m sure it takes time to learn to use but it would be fun! Some great ideals here . I bought the Plexusco 3 wheel pack for my sister about 6 months ago and she uses it every day. There are a lot of great ideals but I have already bought the wheel. Was talking to my sister on the phone and she was telling about her back problems. Later that day I saw the wheel and read a lot of good things about. I ordered and had it mailed to my sister. I am looking for ideals to christmas gifts for 2 toddlers and their were several things I really liked. I ordered the teach my yoga mat on amazon. I though it would be a lot of fun. I like your writing style your blog is so interesting and informative for me and i am very happy to find this post. Sometimes get troubles with these assignments and projects. While Java is still a fair programming language as compared to other languages, it is still very complicated to make assignments and projects. Students often take Java Assignment Help from the online writing services to help them out from this difficult situation.